Lens Description: The 8mm Ultra Wide Angle f/3.5 Fisheye Lens for Nikon w/Focus Confirm Chip from Samyang gives you a dramatic 180° view with a greatly exaggerated perspective when used with an APS-C camera. This fisheye lens includes a special chip that allows the lens to work with the camera\'s focus confirm, auto exposure, auto metering and auto white balance functions. Hybrid aspherical lenses and multi-layer coating help you to produce sharply defined images with a minimum of flare and ghosting. 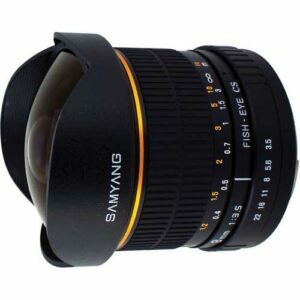 The lens focuses as close as 1\' (30.48 cm) from the lens, and has a built-in petal lens hood.